Financial planning doesn't happen by chance, rather, it is the product of meticulous, sound decision-making. Whether you are looking to protect, grow or transfer wealth, as a Wealth Management Advisor, I am here to help. With a deep understanding of complex financial issues as well as the intricate economic forces at play, we provide guidance that you can trust. Financial planning is about bringing the future into the present so that we may act now, though, this requires a commitment of time-both yours and ours. We will work to understand your current personal circumstances, financial position, and your goals for the future in order to craft a personalized planning solution that is right for you. Our team will then develop and implement a financial plan that balances your short-term needs with your long-term goals. Together, we regularly review your financial plan and assess your financial progress, making sure that your overall financial picture for the future reaches its full potential. Backed by the strength of Northwestern Mutual, my team and I provide you with a balanced approach to achieving your goal of financial security, assuring that your intentions have been understood and your needs are being addressed. And, when it comes to implementing solutions, the full capabilities of Northwestern Mutual are leveraged in an integrated approach that helps you build an achievable, flexible financial plan with the right mix of insurance products and investment strategies to help get you to your goals. How important is it to you to retire only once? What have you done so far to finance the last 30 years of your life? How much do you want luck to play a role in determining your investment and retirement success? What would reduce the stress you have concerning retirement money matters? What have you done to prepare for the next downturn in the market? How large a debt burden do you want your child to have after college graduation? 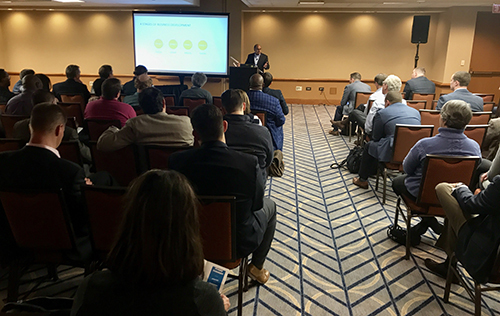 Baji was honored to speak at the 2018 Northwestern Mutual Central Regional Meeting on business financial planning. Northwestern Mutual is the marketing name for The Northwestern Mutual Life Insurance Company, Milwaukee, WI (NM) (life and disability insurance, annuities, and life insurance with long-term care benefits) and its subsidiaries. Bharadwaj Venkata Surya Puram is a Representative of Northwestern Mutual Wealth Management Company®, (NMWMC) Milwaukee, WI (fiduciary and fee-based financial planning services), a subsidiary of NM and federal savings bank. All NMWMC products and services are offered only by properly credentialed Representatives who operate from agency offices of NMWMC. Representative is an Insurance Agent of NM, and Northwestern Long Term Care Insurance Company, Milwaukee, WI, (long-term care insurance), a subsidiary of NM, and a Registered Representative of Northwestern Mutual Investment Services, LLC (NMIS) (securities), a subsidiary of NM, broker-dealer, registered investment adviser and member FINRA (www.finra.org) and SIPC (www.sipc.org). Bharadwaj Venkata Surya Puram is primarily licensed in Minnesota and may be licensed in other states.